As a company, Microsoft is performing quite well and is as stable as always, but its stock is a whole different story. Investors are becoming increasingly annoyed that they can't make the money they used to from Microsoft shares. Because of poor stock performance, Microsoft CEO Steve Ballmer is being frequently criticized for being an inadequate leader of the company. 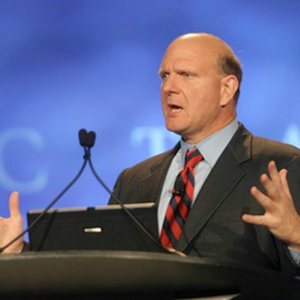 Complaints recently hit a peak and Microsoft's board has declared it is backing Ballmer, according to Reuters. Last week, David Einhorn of Greenlight Capital said it was time for Ballmer to step aside and give someone else a chance. Einhorn, an influential hedge fund manager who made a name for himself after warning about the financial health of Lehman Brothers before the investment bank's collapse, criticized Ballmer's "Charlie Brown" style of management and claimed his continued presence is the biggest overhang on Microsoft stock. One of Ballmer's most recent decisions is arguably one of his biggest. Following rumors that Google, Facebook, and Microsoft were all interested in the Skype, the software giant swooped in. Two weeks ago, Microsoft announced that it was acquiring Skype for $8.5 billion in cash. The deal was approved by the boards of directors of both companies, and is Microsoft's largest acquisition to date. Microsoft chairman Bill Gates, who also happens to be the company's co-founder and Ballmer's predecessor as CEO, said he "was a strong proponent at the board level for the deal being done." This came as a shock to those who believed it was Ballmer who orchestrated the whole purchase, but Gates was backing the talks as well. In short, Ballmer has the support of the Microsoft board, including Gates. Unless investors manage to convince him to step down themselves, Ballmer is not going anywhere for the foreseeable future.